At Carden Conservatory, we believe physical activity and participation are important for all students, regardless of their level of athletic skill or ability. Throughout various activities, student will earn how to incorporate physical activity into their daily lives. We focus on development of the individual, as well as an individual as a member of a team, and always encourage good sportsmanship. In addition, we hope to instill enjoyment of physical activity by practicing skills and drills associated with various sports. We also hope to instill an understanding of the importance of maintaining physical fitness, and its importance to our overall bodily functions. 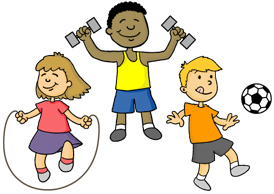 Physical Education is an important part of the total educational program. Students participate in daily physical activities that allow them to develop an understanding of the physical abilities of themselves and others. Students become aware of the social benefits of physical activity through participation. The mental and emotional benefits of physical activity become evident when an active role in physical activity is encouraged. The total development of students is the goal of the educational system. Physical Education is a vital part in reaching this goal. A variety of activities are incorporated into the physical education program. Activities vary form creative movement to lifetime sports. The age level of the individuals is a factor determining what activity is to be provided, but the outcome at any level should be the same. All students have the need and the right to enjoy the benefits of physical activity. Through a creative and well-rounded physical education program, students will see long term benefits. In addition to daily PE instruction for Kindergarten through Eighth Grade classes, students experience weekly Yoga instruction that allows their mind and body to become balanced and benefit from this experience.